It’s easy for me to be a breathless fangirl when I truly love a garden. I wanna show you this and this and this and isn’t it all amazing? But then I take a deep breath. Helen, I say, control yourself. 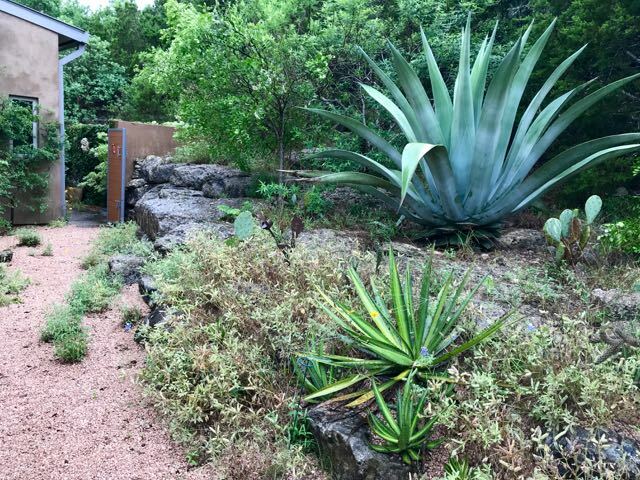 This garden is in Austin, Texas. Texas! 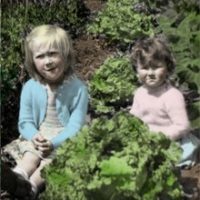 What would that mean to garden people in Toronto? And I have the answer. Lots! After visiting so many gardens in places with plants I can’t grow (and gardens I can’t afford), there’s always something to inspire or teach a Toronto gardener like me. 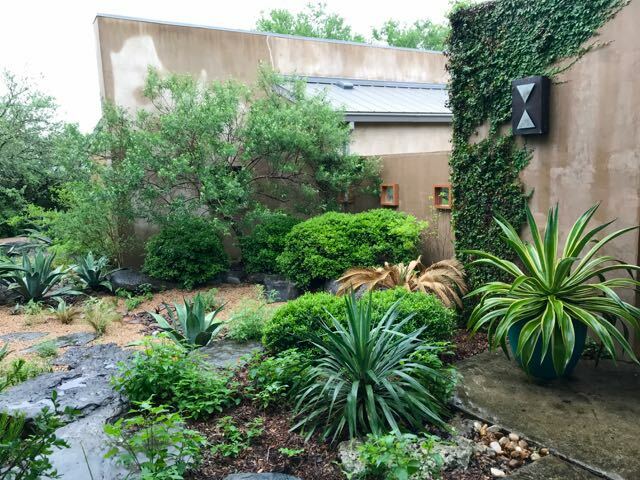 That includes the garden of Jenny and David Stocker, seen on the recent Austin Garden Bloggers Fling. 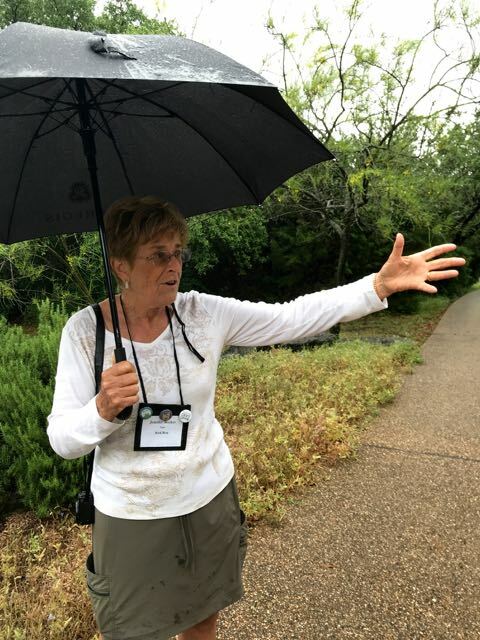 Despite the rain, Jenny’s welcome was warm. See. I’m not the only one getting excited. One Toronto connection: Jenny and David once made their home in Oakville, Ontario (and before that in Montreal), among the many cities these native Brits have lived in over the years. 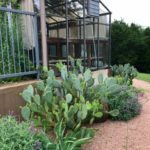 Jenny blogs at Rock Rose (Lots of Rocks and a Few Roses) and her creation here is a wonderful mashup of English and Texan garden styles. This is the view that had us all jammed together to take that shot. Call it the entrance that entranced! 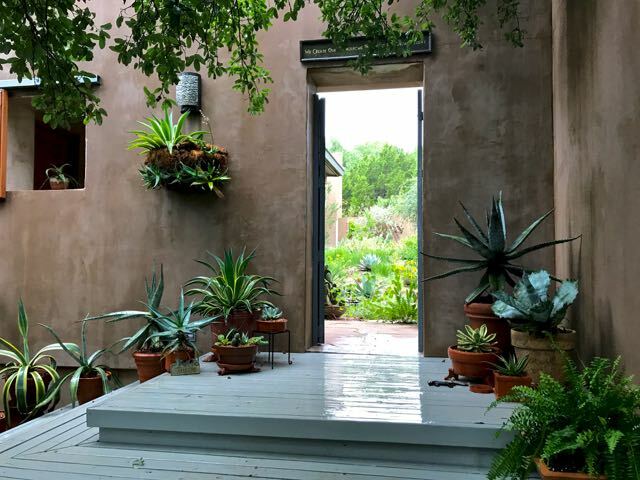 Entryways are such an important parts of our home, yet how many of us use garden tricks to make the most of them? 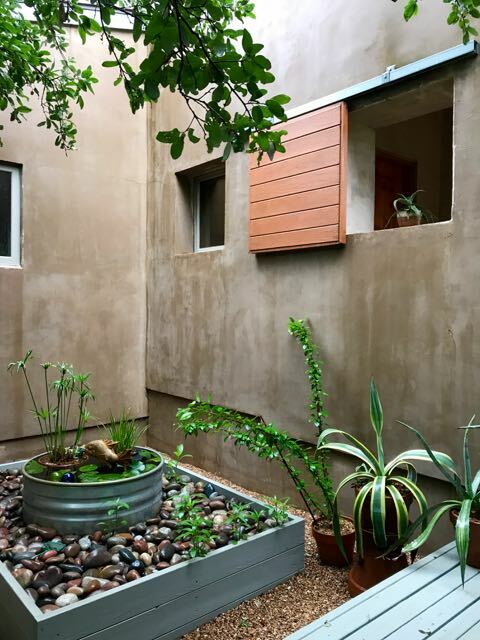 The wide steps leading to the gate give an expansive feeling to the small entry courtyard. Jenny frames hers in vignettes of sculptural succulents. 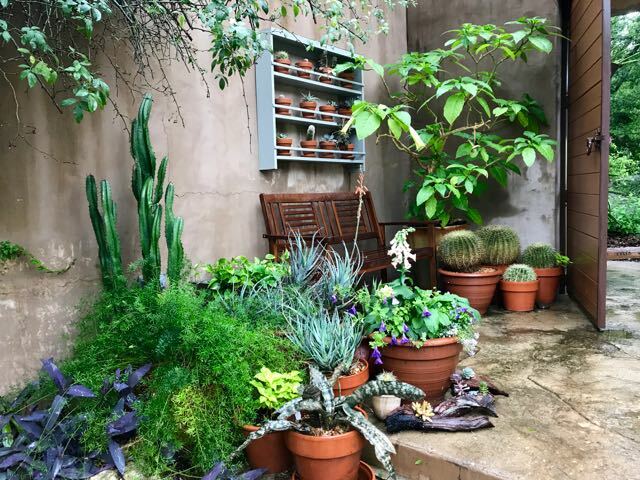 Have a look at the detail shot below, and you’ll see that her groupings of individual pots blend as cohesive units, with varying heights, sizes, and, of course, colours, shapes, and textures. 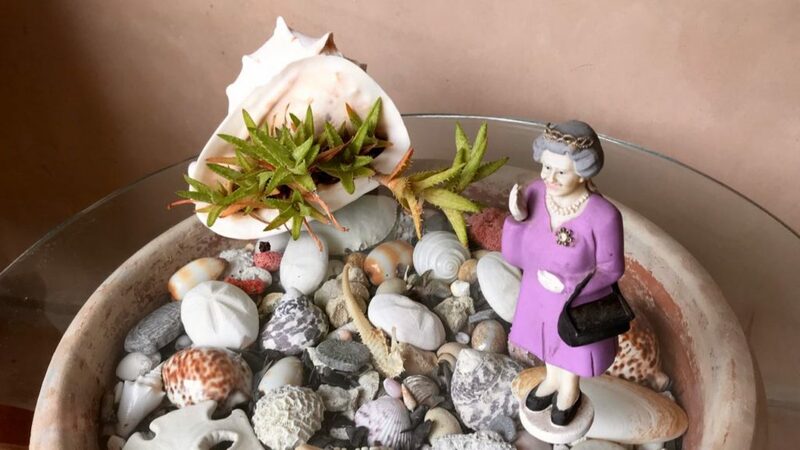 She makes room in her entry court for a water feature. 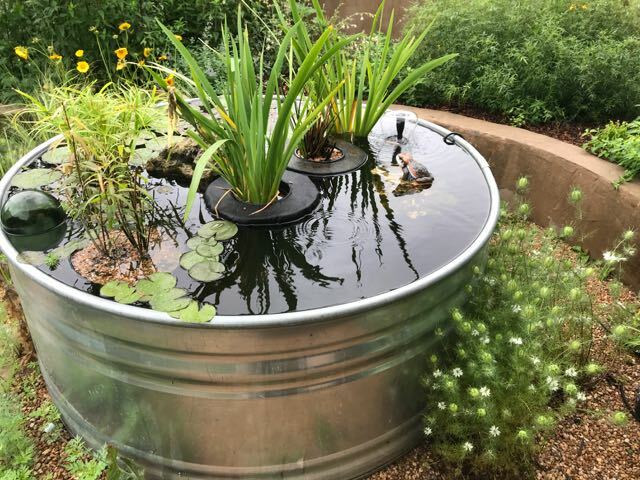 A simple idea for a tiny pond. Jenny does pots so well. Jenny’s garden is a series of garden rooms, and she excels at celebrating the movement between one and another. You don’t just pass through a doorway or under an arch. She gives you a reason to pause for a minute and savour it before you continue on to experience something new. This passageway even offers us somewhere to sit. Plenty to contemplate in this secluded spot. 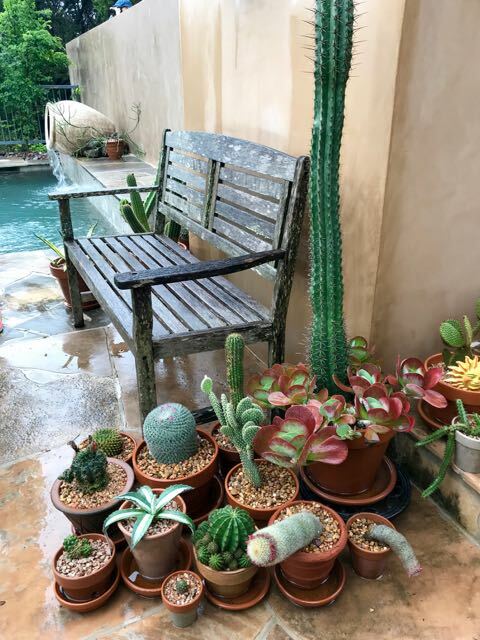 We need more seating in our gardens, don’t you agree? 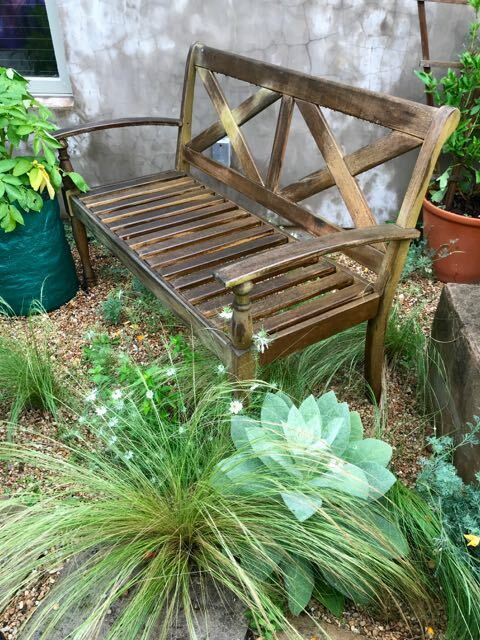 No matter whether it’s a garden bench or seat or stool or stump, this is like a hand that reaches out, gently touches you and says, Why not sit down for a minute and have a little think? Here, you can gaze at the quieter view on the other side, shown below. Six outdoor seating areas give the Stockers a wide choice of open-air areas (open air-eas?) to enjoy in different times, temperatures, weathers or seasons. Going out, on the right. Or coming into the space. 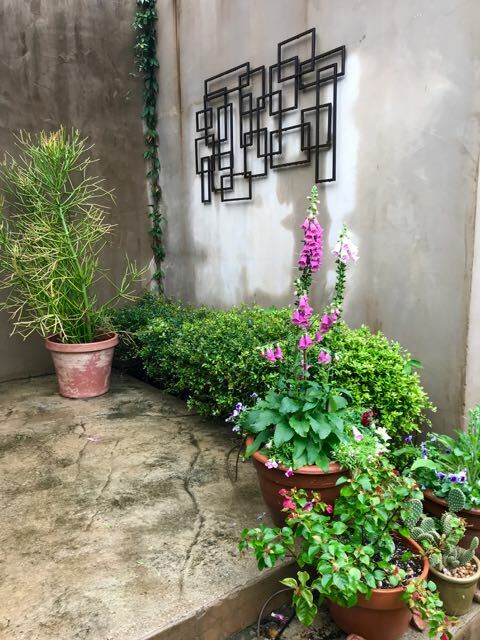 Note how this British transplant doesn’t hesitate to combine hot-climate succulents with English country garden flowers like foxglove (Digitalis). 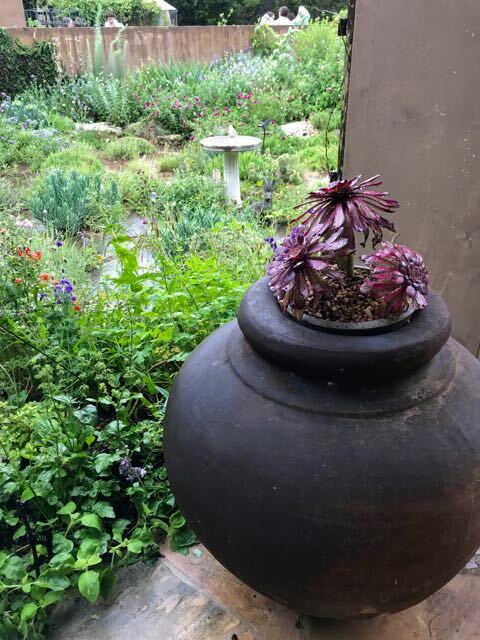 You’ll see that often in this garden, full of happy self-seeders and mementos from the Stockers’ adventures around the world. And yet it all holds together. 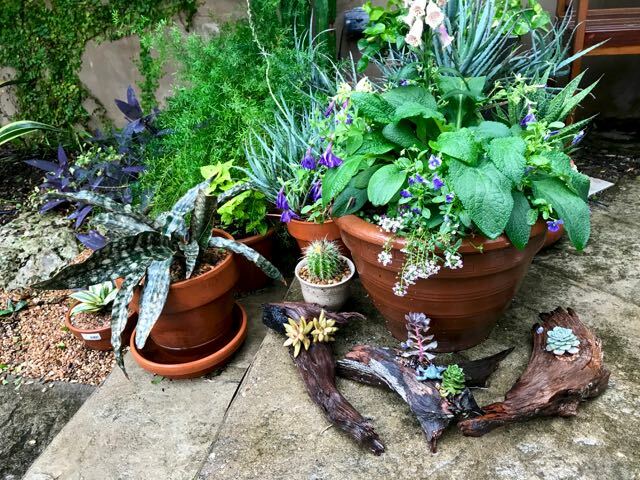 A closeup of the shot above shows the combination of succulents and driftwood – an idea I want to try. Below is another transition spot beside the swimming pool. 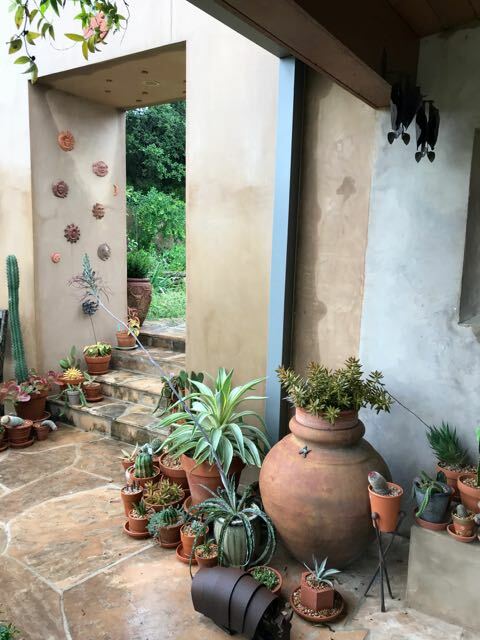 I love how Jenny uses the mass of large jars to anchor the collections of smaller pots and stop them from looking too bitty. One of many ideas to steal learn from. An urn on its side spills water into the pool. 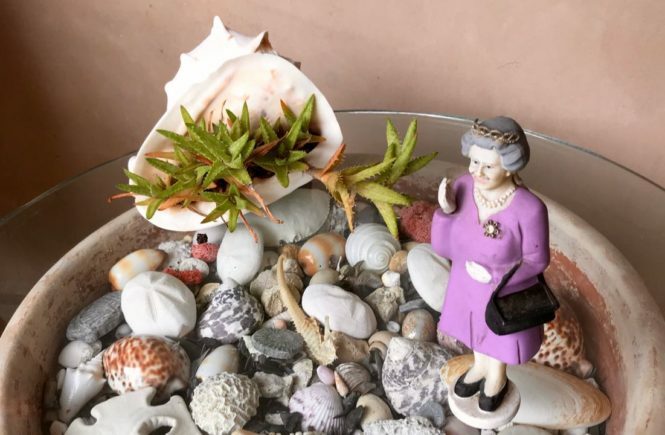 A small pot of succulents tops the fat-bellied urn. Too often, we see that the house is the house and the garden is the garden, and never the twain shall meet. The Stockers took pains to do the opposite. 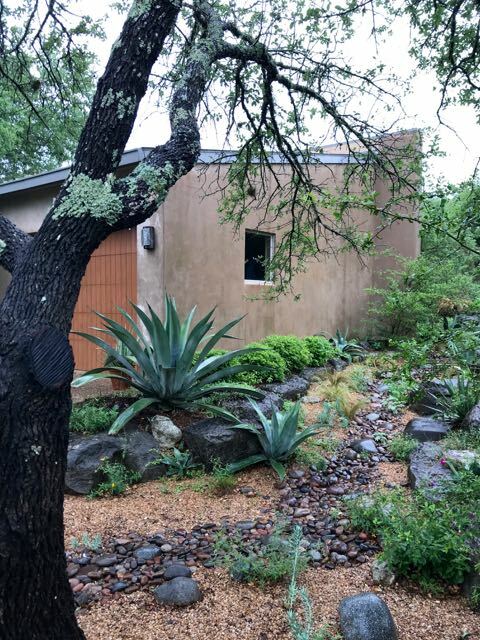 The landscaping and architecture belong to each other. 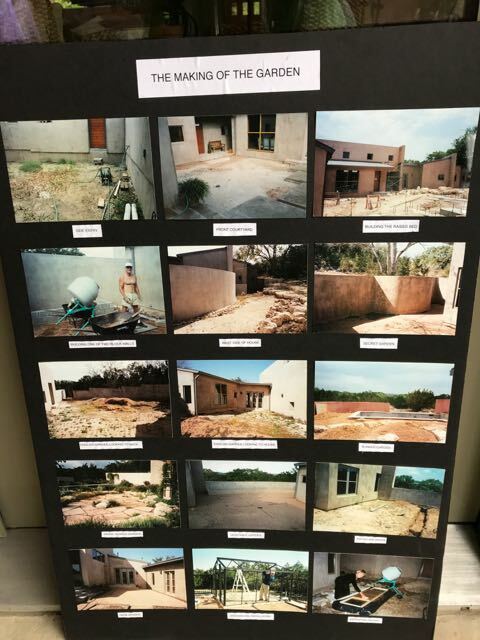 The house was finished in 2001, and work on the garden began shortly after. Seventeen years is a long time to work on a garden but, to me, the Stockers have created something that suggests even greater permanence. House and garden look like they’ve been here forever. 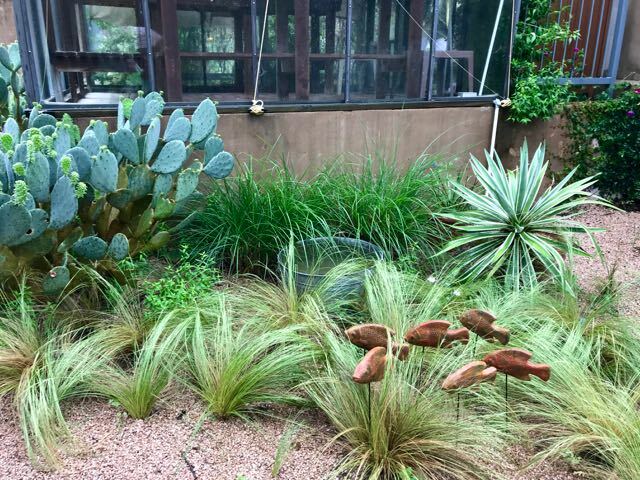 The planting style is naturalistic, even if the plants themselves might not be native. 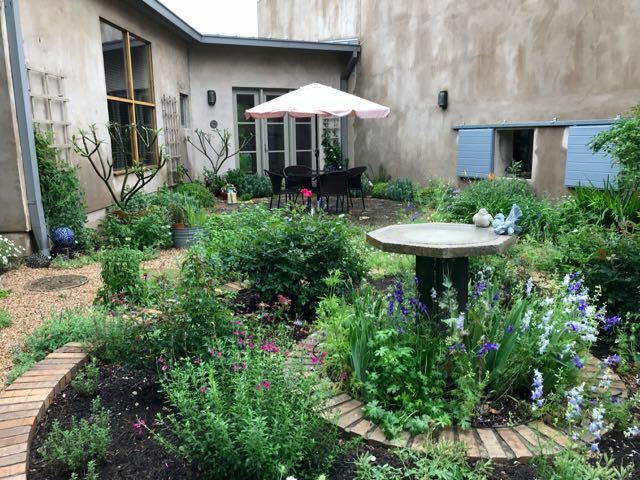 Wilder xeriscapes lead to lusher courtyards, where the roses of Rock Rose might be found. The house was designed with the gardens in mind, featuring walls to keep out deer and plenty of doors and windows to welcome the outdoors in. 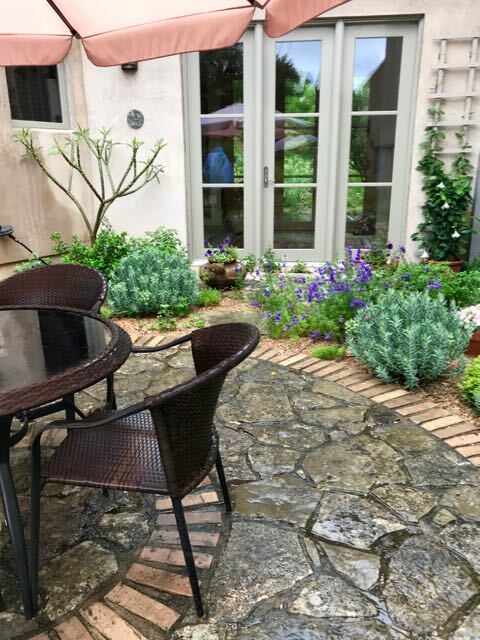 Plus, the gardens themselves are built of the native stone in the grounds – the “rocks” in Rock Rose – hefted around by Jenny’s indispensable “rock man” David. 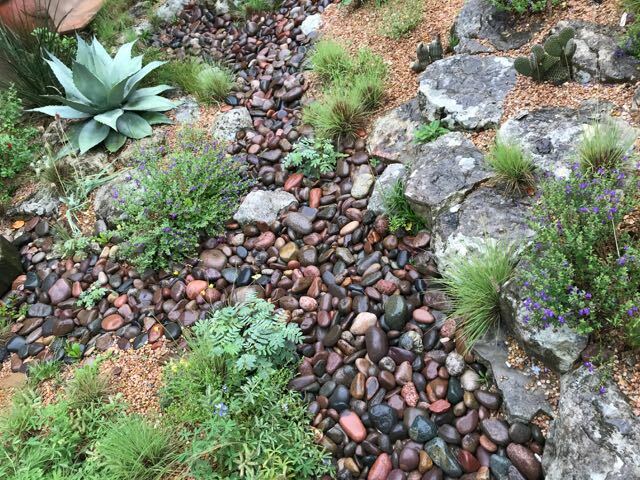 Rocks piled into rock gardens create growing pockets in the thin soil, and river stones offer dry creeks to channel sudden rainfalls. The result feels totally natural. You can get a sense of the before and after in the progression of shots below. 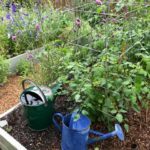 If your garden style (like mine) tends to the wanton, then hardscaping can tie up the loose tresses into something tidier. Imagine the picture below without the organizing framework of those concentric brick circles. 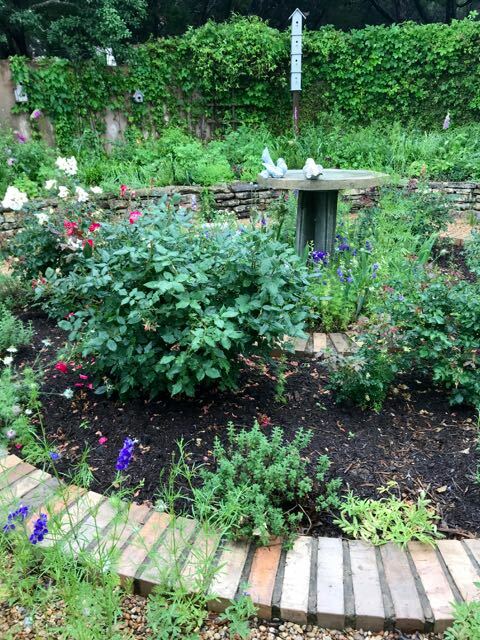 The circular planting beds around the birdbath are mirrored by native crazy paving under the dining area. This is another English garden theme spelled out in a United Nations of plants. I believe this is what Jenny calls the English Garden. This paving detail shot also shows how the windows look right through to another garden. A dry stone wall at the back offers another place for plants to grab a root-hold. 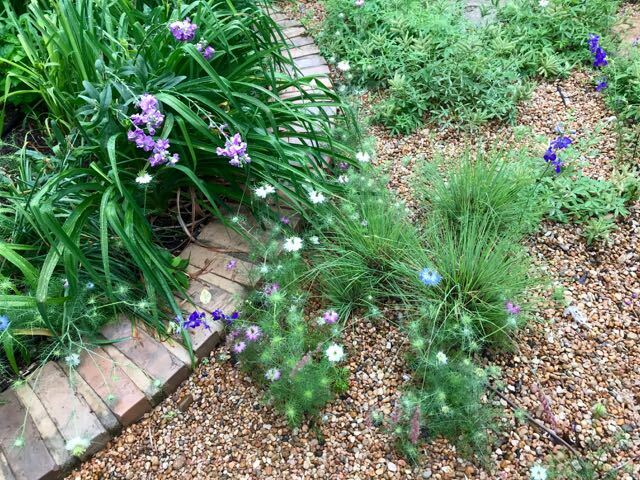 Native larkspur (Delphinium corolinianum) self-seeds along with Old World stocks (Matthiola) and love-in-a-mist (Nigella). 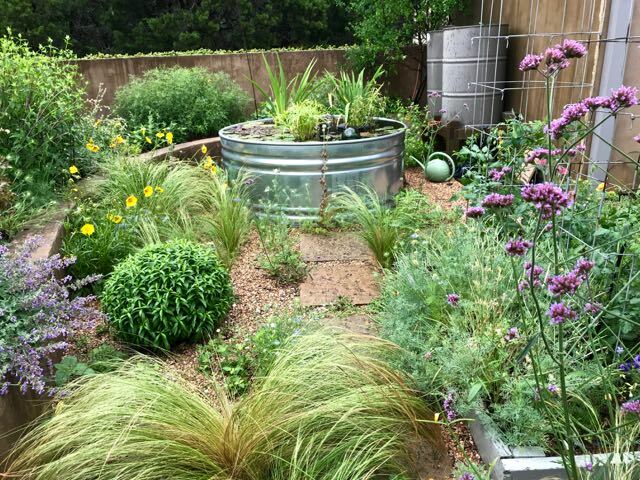 We saw them all over Austin – not only water features of every description, but big, sometimes ginormous, water tanks – too big, really, to call rain barrels. 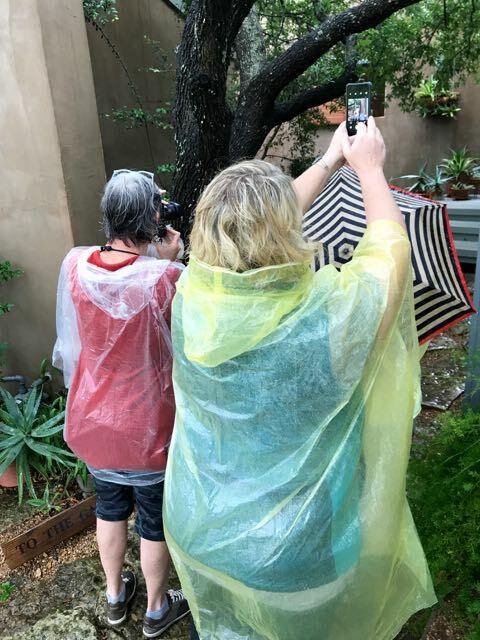 This is absolute worship of water that either comes too seldom or in the sudden, brief torrents they call Texas gully washers. We shouldn’t feel smug about water, just because we live by the freshwater sea of the Great Lakes. Water is something we need to appreciate, protect, and conserve. People living in increasingly dry climates know this all too well. Yes, it can be possible to have too many ornaments in a garden. But Jenny’s approach has a few things in its favour. The large scale of the garden, with its many rooms, was never overwhelmed by the little accents. 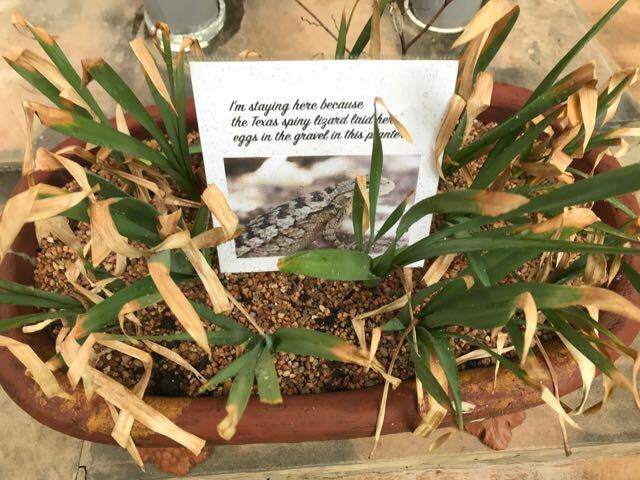 Smaller gardens need to be more careful. Sometimes, like the covey of quail, the accents were easy to miss, making the surprise of noticing them more… surprising. And more fun. 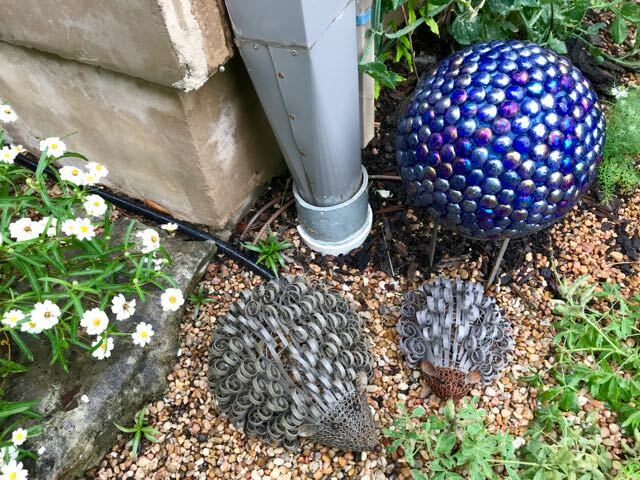 Hedgehogs tucked into a corner. A family of quail concealed by the pond. 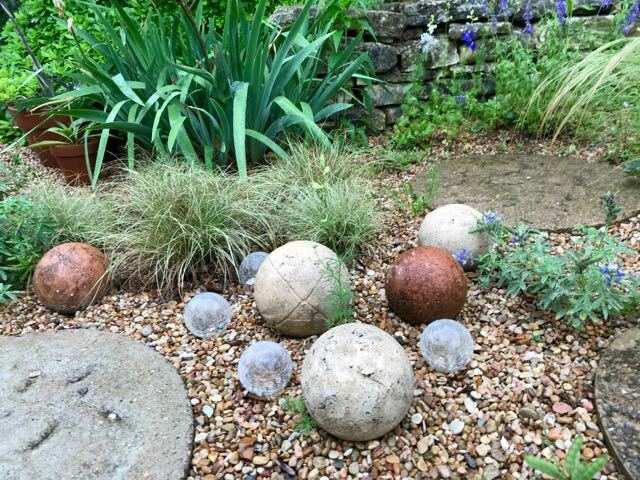 Some of Jenny’s hypertufa balls. Grass stream with floating fish. Surprises don’t need to be limited to ornaments. 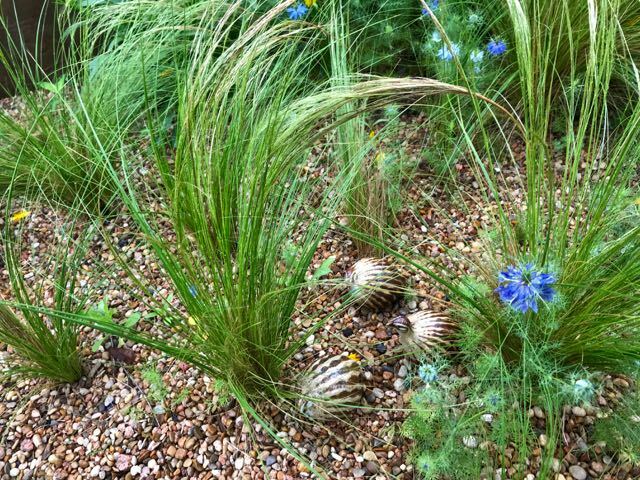 Even the way you plant, or the plants that you combine, can offer discoveries as you tour a garden. Huge urn, colour matched with a tiny plant stopper. Great combo. Soft grass (planted) with rosette of mullein (probably not). A living bouquet. 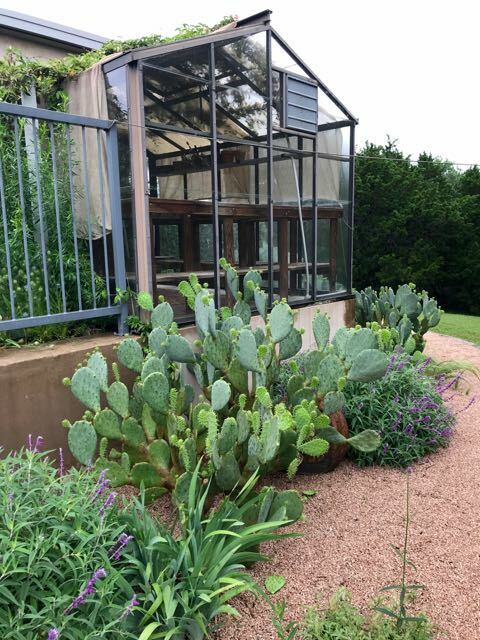 In early May, Texas gardens are waaaaaaaay ahead of Toronto gardens. 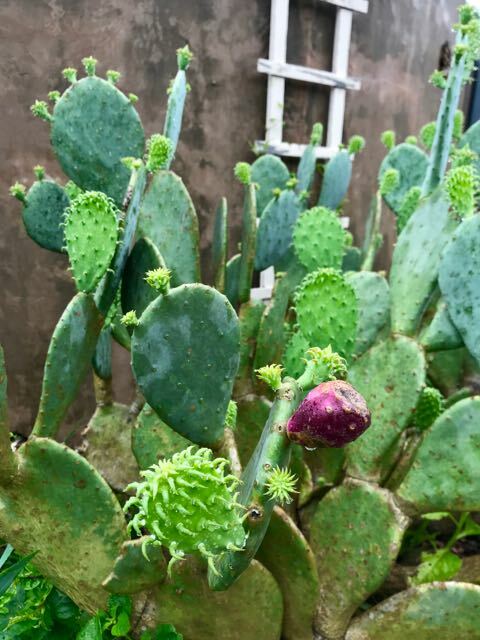 In addition to envy, that let us see so many gardeners, even those in Architectural Digest-style homes, making edibles prominent parts of their gardens. It’s easy to squeeze in a veggie or two. 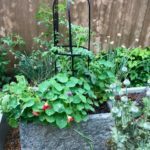 Jenny’s garden trough is a styrofoam box in disguise, using a method like the one we wrote about here. Remember to think about fruit, too. 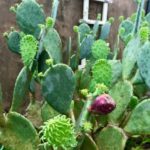 If not a prickly pear (in this case, un-prickly aka spineless prickly pear (Opuntia)), then look for underplanted things we can grow, from gooseberries (Ribes; there’s even a native one) to haskap berries (Lonicera caerulea). We share our gardens with other creatures. Many, despite appearances (Yes, spiders, I’m looking at you), are our friends. The Texas spiny lizard is a carnivore. 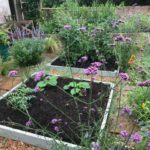 While it might vary its diet with beneficial insects (What?! 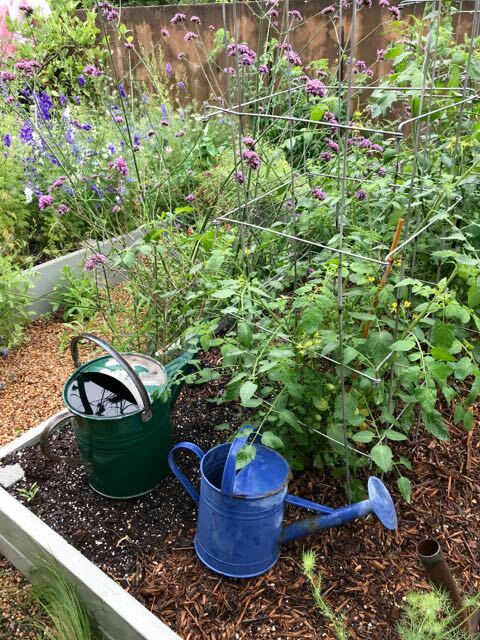 ), is also has a healthy appetite for garden pests (Okay, forgiven). Live and let live – which was why I’m never bothered when a carpenter bee, a useful native pollinator, drills a hole in my unpainted cedar. 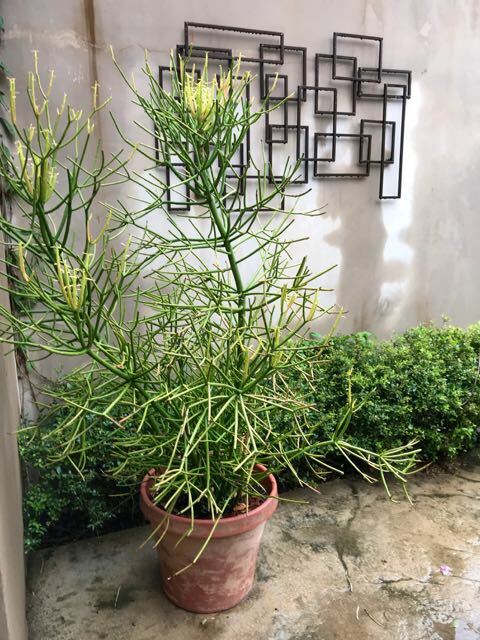 So I thought it cool that Jenny’s past-its-prime garden container would be staying untouched for the couple of months it would take to let the eggs hatch. Let’s do more of being kind that way. 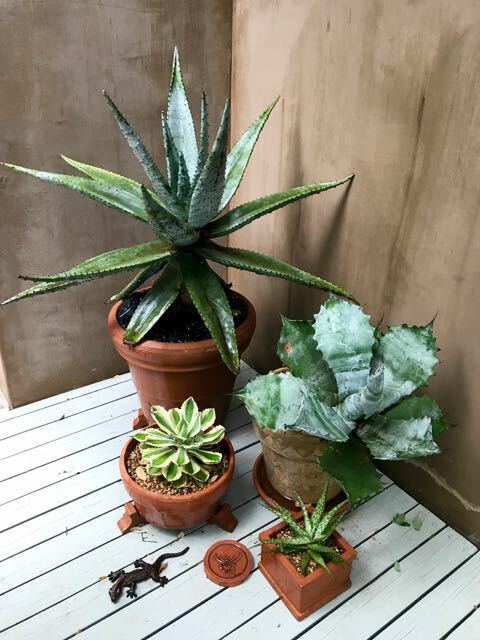 Part planter, part maternity ward. 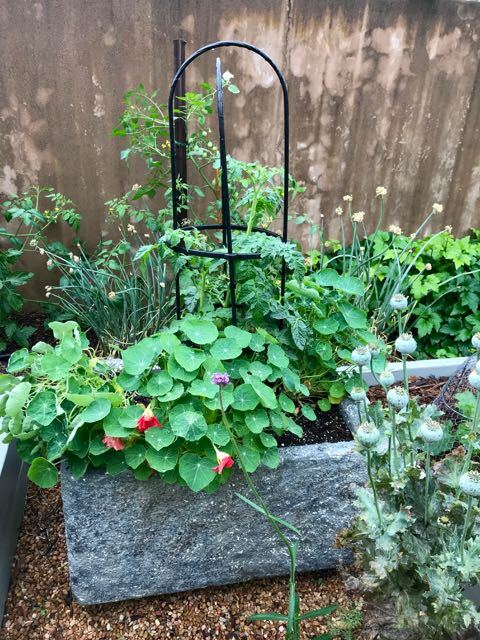 What do you think of the garden? And if what you think is that you want more fangirl, I have about 100 more pictures to show you. Just let me know. 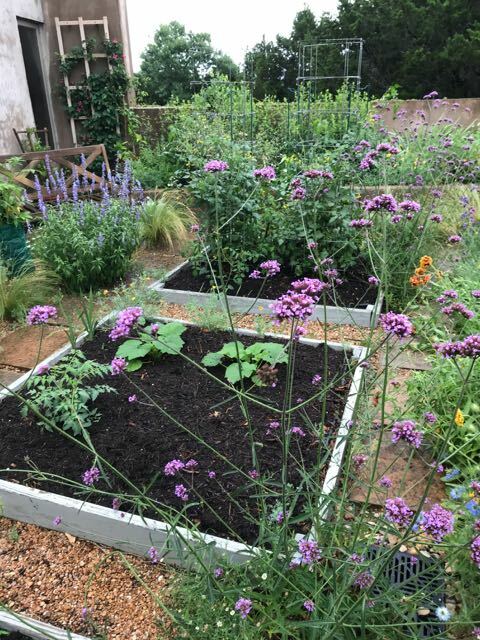 It’s impossible not to fangirl about Jenny’s garden, and I enjoyed seeing what you took away from it, Helen. Great lessons! Thanks for giving us the chance to see it, Pam!